I don’t want to pick on you, honestly. I like your train booking service. But there is nothing and I mean nothing worse than pretending to listen, saying you’re going to act and then simply not bothering. I gave National Rail quite a hard time a few weeks ago as they sent me an email from a ‘noreply’ email address and pretended it was from my new best friend and CEO Chris. You can read that here. But they really impressed me with their instant response on Twitter. I had high hopes. For a moment or two I thought it may actually be worth big organisations having teams monitoring and responding in social media platforms. But then they reverted to type and 13 days after their initial email, they sent me this. 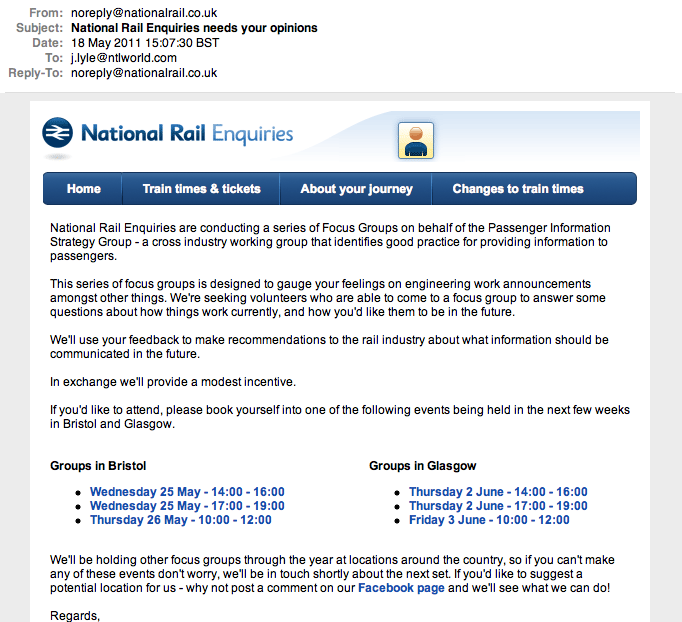 National Rail - We pretend we listen, but we don't. Worse still, it is asking for me to be involved in telling them what I think. I told them what I think and they ignored it. Any business is allowed to make a mistake. We all do, but hopefully we learn from them and change something to not make them again. To come out so publicly and say you were going to change ad then not quite bothering is terrible. I’m sure you’ll pick this article up again, like you did last time. I reckon we may get some platitudes, but this is really, really poor. National Rail have just proved to me why they shouldn’t bother with a social media or PR team. What is the point in listening to Twitter if you don’t act ion feedback. What is the point on surveying your customers if you do nothing with what you learn from the information. You truly are a pathetic bunch. Why do you keep sending me emails from DONOTREPLY email addresses more than a month after you said you’d stop doing it? 87 days after the experiment started, it has ended. I was speaking to a friend yesterday (hello Simon) and I was getting complaints that he couldn’t hear me and that I sounded like I was mumbling. I came to the sad conclusion that my old Nokia had seen its best days and was now effectively scrap. So the iPhone came back out again. But what have a I learnt? 1. Push email is a total pain. I would rather wait until I got back to my computer and dealt with the emails properly. When I was away on holiday last week, I left with no emails in my inbox. As it stands today, there are now seven. That is a huge improvement from my position at the start of the experiment. I have become more efficient. 2. There was very little I missed on the iPhone. Most of the apps are nice to haves. Almost none are need to haves. 3. I saw a new sale board for our client Royston and Lund. This was the first one we had done where each property has a unique QR code to allow you to view the property details for each house they list. I did feel a bit left out not being able to jump out of the car and grab the code to start browsing. I think this will become increasingly important over the coming years. 4. The amount of extra thinking and reading time I have gained has been amazing. I will vow to keep off the apps and on my reading. I have watched almost no TV since I left the iPhone at home and feel better and brighter for it. That’s it, the end. It’s been a blast. I hate this. 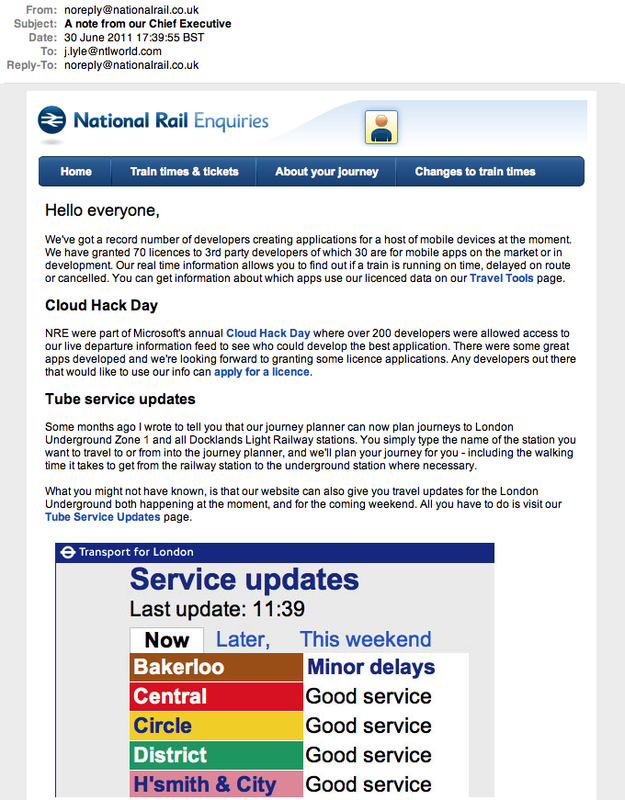 The Chief Exec of National Rail gets down there with the kids and signs his emails personally. he cares about us customers, and signs it with his first name only. He knows us so well, we’re mates, known each other for years, bezzies even. Thanks Chris, call me John, or Johnny to my friends. He even cares about whether I enjoyed the Royal Wedding. I know, I’ll tell him I loved it. Yes Chris, I thought it was great, best of British, just like our rail service. But do we believe he cares? No, not really. He has sent out the clearest posible signal that he doesn’t want to listen to ANYTHING we have to say. He’s talking at us, not with us. There is no listening involved. He doesn’t care what we say. he’s sent it from a ‘noreply’ email address. I presume this means we can’t reply. Living proof that he doesn’t care enough to listen to us, but he’s happy to hawk the new services that have been designed with us in mind. So ask yourself if you should care enough to use his service. Well, probably you should as it’s still better than theTrainline.com. And ask yourself again, whether you ever do this with your own clients. National Rail have responded on Twitter almost immediately, which is good and they;ve commented below. Good work team, maybe now change the email send address? 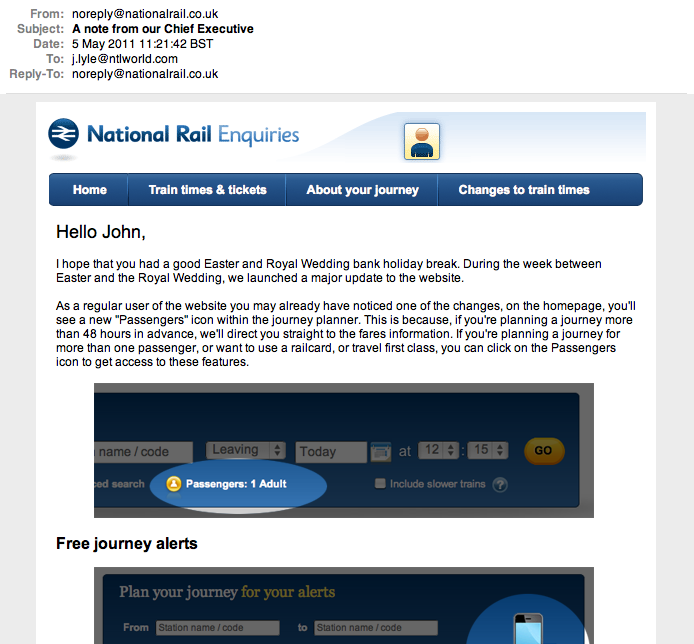 Okay, National Rail DO listen and they Do care. Twitter can really have some power if you use it as a listening tool. How good is this? I am now 66 days into this experiment and still going strong. My old Nokia is working well i’m getting very few complaints about people not being able to hear me. And guess what, it doesn’t randomly reset itself, run out of battery or burn my ear like the iPhone did. I have used the iPhone a few times, but only as a speed camera detector as I have done so many miles over the last few weeks/months. I did think I would have gone back to it by now, but even though I am getting loads of pressure to hand over the phone to the kids for their own personal use, i’m still carrying the iPhone just in case. 1. It’s actually quite liberating driving around listening to the radio. 2. I haven’t had any crashes or hit any wildlife because i’ve been checking my emails. 3. Apple are advertising quite hard again, which means they must be reaching a plateau in sales. Many people seem to be buying things a bit like an iPhone, like an HTC or other Android Phone. 4. Others have tried it too. But I can’t find many who have stuck to it. Maybe I am odd after all? You may well have seen this ad already. My children dragged me onto YouTube to see it, they liked it so much. I do to. 1. The branding is almost too subtle. The first shots of him holding the milk carton display no branding whatsoever, other than the green stripe around it. 2. It is properly joined up in it’s social media. The Twitter account is well worth a look and it is written (or tweeted) beautifully in character of a slightly sinister cat Bertrum Thumbcat. 3. It is very cleverly built with embedded links into the video. This means that it must be a paid for placement as YouTube don’t allow for link embeds as we have discovered with my son’s social media experimenting. 4. It is ripe for running. By this, I mean that this will be the first of a series of ads to follow in the same storyline, like the Meerkat ones. I’m quite looking forward to seeing the Thumb Cats slowly taking over the world.